The arrival of the freshly picked green peas is a telltale sign of spring. The tender, sweet, plump peas must be shucked from their inedible pods and can be eaten raw or cooked. The tender shoots or tips of the vine can be eaten as well. Peas can be used raw in salads, steamed, boiled or blanched. They are great in soups, purees, as part of a vegetable ragout, and in stir-fries. Peas are divided into two categories: those with edible pods or inedible pods. The pea we are familiar with, also known as the green pea and garden pea, has an inedible pod. 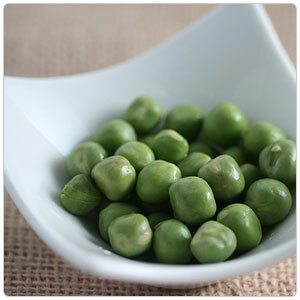 Most commercial peas are called English peas or garden peas. Peas known as sugar peas and snow peas have an edible pod. Today, of all the green peas grown, only five per cent come to the market fresh, more than half are canned, and the remainder are frozen.